An atoll island in French Polynesia, Rangiroa is best known for its amazing lagoon and drift diving. 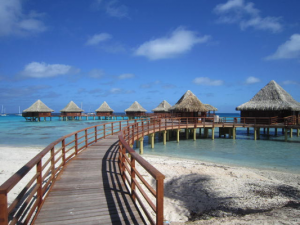 However, the last year Rangiroa has been without any decent accommodations, since the Hotel Kia Ora closed for a complete rennovation. But yay, good news! The Hotel Kia Ora is scheduled to open on time — September 2011. Bungalows and public buildings were torn down and rebuilt, and I’m betting this will take the property from a 4 star rating to a 5 star luxury. That’s just my guess. I’ve actually been to this property, back in 2009, and thought it was fantastic then. So I can’t wait to see what the property manager Jerry Garcia has done with the place. I definitely plan a visit the next opportunity that comes my way. I’ll pop back on the blog and let you know the scoop on the new and improved Hotel Kia Ora, but meanwhile, a little bit of information based on the original property (and my stay there in 2009). The pictures below are new (taken in August 2011). (2009): It is advised to pre-book the meal plan, which includes a hearty breakfast buffet and dinner daily. The breakfast pastries and desserts are expertly created by the Hotel Kia Ora’s own pastry chef, and dinner selections are diverse, with French inspired dishes, local specialties, and the Chef’s daily menu. Meals here are reasonable, considering the pricey cost of food in Tahiti. As well, the bar list is fairly extensive. Lunch options are a bit short; you can select from a small number of sandwiches from the bar, or commit to a lunch in the restaurant. However, two main meals (breakfast and dinner) are the way to go, with something light to tide you over at lunchtime. Happy news, bungalows are being outfitted with television and internet access. Accommodations include overwater bungalows, garden bungalows, and beach bungalows. Some units are multi-rooms and have infinity pools on the deck. For divers and snorkelers, Tiputa Pass a pass/drift dive toward the ocean with a variety of fish, eels, turtles, and sharks. 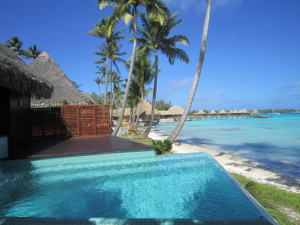 Other diving and snorkeling opportunities abound, and the Hotel Kia Ora has reasonably priced off-site activities available during the course of your stay. Sister property Kia Ora Sauvage is still being remodeled, and will not be reopening yet.